Gmail is a free webmail system and email service from Google which users can access on a web browser, through its Android and iOS mobile app, or using third-party programs. It provides them with a 15 GB email storage and the capability to send an email message with up to 50 megabytes of file attachments. In addition, Gmail supports advertising wherein it adds context-sensitive advertisements to emails. The program organizes emails into folders and tabs wherein emails are automatically sent to specific folders based on their type and are categorized as primary, social, promotions, and more. Furthermore, Gmail uses conversation threading which stacks and organizes messages and conversations into threads, enabling users to access previous related messages they sent out. The webmail system automatically scans emails to check for attachments that may contain viruses or malware. It offers a spam filtering feature which automatically recognizes and tags spam messages, and stores them in a spam folder. Meanwhile, Gmail provides composition tools which enable users to customize their email messages with stylish fonts, colors, indents, bullets, hyperlinks, emoticons, and photos. To connect with their family and friends in real time, Gmail offers instant messaging and video chat features. Last but not the least, the program integrates Google’s main services into a single interface. These services include Google Calendar, Google Drive, photo hosting, and news. Gmail offers unique and powerful ways of organizing emails. One of those ways is through its conversation threading. This is a feature that automatically groups email messages and conversations into threads based on their subject lines. Thus, as they send and receive messages, Gmail loads up all the messages they previously sent and received which are related to a particular subject line. Because of this, they won’t have the difficulty of searching and reviewing the previous conversations and discussions they have engaged with, as the program stacks and organizes them in one location. Additionally, Gmail has an inbox structure that organizes emails using tabs. These tabs are primary, social, promotions, updates, and forums. By enabling these tabs, users will have separate inboxes for receiving messages and email notifications from social media networks and websites, marketing campaigns, billing and membership updates, online groups and discussion boards, and person-to-person conversations. Emails are automatically redirected to these tabbed inboxes. Gmail also uses labels to organize emails. Labels are actually tags that users can apply to their email messages as they compose, read, or move them to specific folders or inboxes. As a result, Gmail will automatically redirect their emails depending on the labels they set up. In addition, Gmail automatically remembers contact information and saves it in the address book. It has the capability to directly import contacts from social media accounts into user’s Gmail account. Also, users will be able to add additional information to their contacts such as birthdates and even images. Meanwhile, Gmail supports file attachments with up to 50 MB size when users send an email message. In case they want to send larger files, they can upload them to Google Drive and insert the files into an email message. 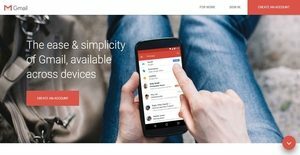 This individual Gmail message storage capacity helps users share photos and documents with their family, friends, and colleagues easily and conveniently. Another interesting feature available in Gmail is its capability to perform through virus and malware check by scanning emails and their attachments. With this feature, users are ensured that their computers will be protected from any harmful applications or files. Gmail automatically warms them when they receive an offending payload in their inbox and quarantines the payload to prevent it from infecting their device. Gmail also has a spam-filtering feature that identifies and tags unsolicited emails and spam messages. Through the aid of spam filters, such emails are automatically redirected to spam folders. As part of Gmail’s security tools, this feature helps users recognize and isolate annoying offers from companies and groups. Gmail moreover enables users to conveniently access the main services of Google. They will be able to book appointments, upload files, watch Youtube videos, read the latest news, search for locations, and surf the web from a single portal or interface in Gmail. This is because Gmail has a navigation bar that organizes and combines Google services which include Google Calendar, Google Drive, Google Maps, Google Search, Google Plus, Google News, and Google Photos. To save time in managing their emails, Gmail provides keyboard shortcuts. Using these keyboard shortcuts, they will be able to quickly navigate through their conversations and messages and archive them. They can also compose messages, create tasks, and manage their contacts in less time using these shortcuts. It is crucial to keep in mind that virtually no service in the Communications Software category will be an ideal solution able to meet all the needs of various company types, sizes and industries. It may be a good idea to read a few Gmail reviews first as certain services may perform well only in a really small set of applications or be created with a really specific industry in mind. Others might function with an idea of being easy and intuitive and therefore lack complex elements welcomed by more experienced users. You can also come across services that focus on a broad group of users and offer a complex feature base, however this usually comes at a more expensive cost of such a service. Make sure you're aware of your needs so that you purchase a service that offers all the functionalities you search for. How Much Does Gmail Cost? We realize that when you make a decision to buy Email Management Software it’s important not only to see how experts evaluate it in their reviews, but also to find out if the real people and companies that buy it are actually satisfied with the product. That’s why we’ve created our behavior-based Customer Satisfaction Algorithm™ that gathers customer reviews, comments and Gmail reviews across a wide range of social media sites. The data is then presented in an easy to digest form showing how many people had positive and negative experience with Gmail. With that information at hand you should be equipped to make an informed buying decision that you won’t regret. What are Gmail pricing details? What integrations are available for Gmail? If you need more information about Gmail or you simply have a question let us know what you need and we’ll forward your request directly to the vendor.